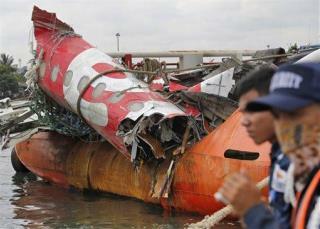 (Newser) – A rudder control system problem that had occurred 23 times in the previous 12 months, coupled with the pilots' response, led to last year's crash of an AirAsia plane that killed all 162 people on board, Indonesian investigators said Tuesday. The National Transportation Safety Committee said an analysis of Flight 8501's data recorder showed the rudder control system had sent repeated warnings to the pilots during the Dec. 28 flight between the Indonesian city of Surabaya and Singapore. Aircraft maintenance records for the Airbus A320 showed that problems with the rudder system, caused by a cracked soldering joint on an electronic circuit board, had been reported 23 times during the year prior to the crash, with more frequent occurrences in the three months before the accident. Airbus is Jaguar of the airplane family. Very shiny and fault prone. Lots of things can go wrong if you don't have a good rubber. Sorry, couldn't resist. Sounds like nearly criminal behavior on the part of the company, and gross incompetence on the part of the pilots.